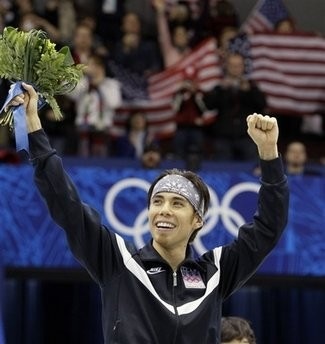 8: Apolo Ohno – The Speed Skater » Change Myself. Change the World. 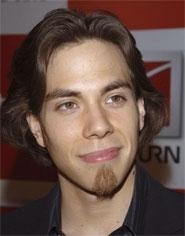 Apolo Ohno has dominated the sport of speed skating for over a decade. He has enjoyed many great successes but also endured major disappointments, his career plagued with mishaps and controversy. He is a person who embraces three major principles of right living: dedicating yourself to your goals, always enjoying life along the way, and knowing how to get back up after a fall. In 1996, at just 13, Ohno joined the Lake Placid Olympic Training Center as the youngest skater ever admitted. His commitment leve was low until his teammates nicknamed him “Chunky” which motivated him to train much harder. Regardless, in 1997 he failed to make the US Junior World Team. That same year in the 1997 World Championships in Japan he finished only 19th overall. At just 14 years of age he was ready to quit. He stopped training for 6 months and gained significant weight leading to his failure to qualify for the 1998 Olympic team. But this failure caused Ohno re-dedicated himself to the sport. In the next few years of his career he finished everywhere from 1st to 9th, winning, losing, and regaining several championships titles. The Olympic Trials in December of 2001 began a string of controversies in Ohno’s career. 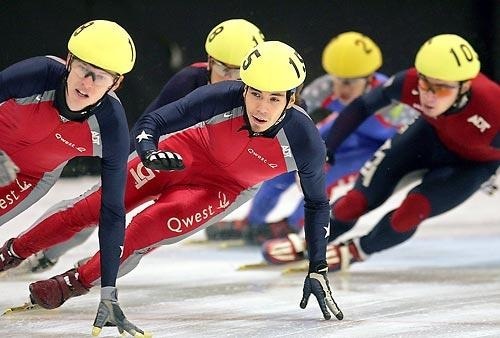 First, he and teammate Rusty Smith were accused of throwing a race to allow their friend Shani Davis to make the US Team instead of skater Tommy O’Hare. They were later absolved of guilt. Next, during the 2002 Winter Olympic games in Salt Lake City, Ohno was on track to win a gold medal in the 1000m race. 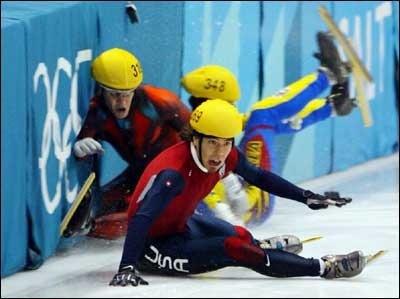 In the final turn skater Ahn Hyun Soo fell and smashed Ohno into the barriers just before the finish line. Ohno quickly got up and crossed the line for a disappointing second place. Then, in the 1500m race Ohno moved to pass South Korean Kim Dong-Sung who then drifted to the inside. Ohno raised his arms to signal a violation called cross tracking and Kim was disqualified. Emails of protests by South Korean supporters crashed the email server of the Olympic committee. The controversy caused Ohno to miss other international championships due to concerns for his safety. 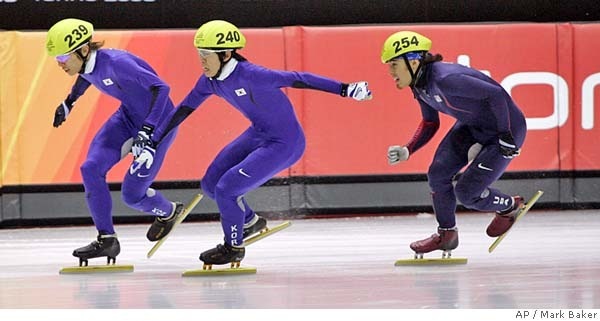 During the next Winter Olympics in 2006, Ohno was on track to win a gold in the 1500m but stumbled in the final lap, losing to Ahn Hyun Soo, the very skater who had caused the crash in the previous Olympics. During the medals ceremony, however, the South Koreans and the Americans embraced and took a group photo ending the controversy from the former games. After the Olympics Ohno continued his dominance in the sport in other national and international competitions. The following year, Ohno, never taking himself too seriously but ever a competitor, was paired with partner Julianne Hough to appear on the fourth season of Dancing with the Stars. Together they received the competitions first ever perfect score of 30 for their samba routine and won the finale after performing a paso doble, ru mba, and hip-hop freestyle in the final competition. 2010 Winter Games in Vancouver – Last night, Ohno was in second place in the 1000m race when he lost his balance with two laps to go dropping him to last place. In a fantastic move to get past the Canadian Hamelin brothers he made a miraculous comeback to take the bronze medal. While disappointed not to win the gold, this achievement earned him the designation of being the most decorated American athlete ever at the Winter Games with seven career medals, two gold, two silver, and three bronze, finally surpassing the amazing Bonnie Blair.